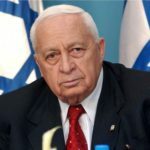 Ariel Sharon was an Israeli general and politician who served as the 11th Prime Minister of Israel from March 2001 until April 2006. Sharon was incapacitated by a stroke in January 2006. Sharon was a commander in the Israeli Army from its creation in 1948. As a soldier and then an officer, he participated prominently in the 1948 War of Independence, becoming a platoon commander in the Alex and roni Brigade and taking part in many battles, including Operation Bin Nun Alef. "The strength that I have comes from irrigating the citrus plantation, ploughing in the vineyard, guarding the melon fields at night. I believe that’s what gave me the strength." "Legitimate steps of self-defence which Israel takes in its war against Palestinian terror – actions which any sovereign state is obligated to undertake to ensure the security of its citizens – are presented by those who hate Israel as aggressive, Nazi-like steps." "I cannot say that the attitude of the United Nations always is for the Israeli attitude. Israel, I think, has been under severe attacks by members of the United Nations many times." "I was born on a farm. My strength has nothing to do with political apparatus. I get my strength from nature, from flowers." "I don’t think I have accomplished what I still have to accomplish. There is one thing that I would like to do, and that’s to bring security and peace to the Jewish people." "Like all Israelis, I yearn for peace. I see the utmost importance in taking all possible steps that will lead to a solution of the conflict with the Palestinians." "If there will be a serious Palestinian prime minister who makes a 100 percent effort to end terrorism, then we can have peace. Each side has to take steps. If terror continues, there will not be an independent Palestinian state. Israel will not accept it, if terror continues." "My strength never came from political echelons, it came from the family. And from the fields and the lands and the flowers and everything I see there. My strength came from there." "To our Palestinian neighbours, I assure you that we have a genuine intention to respect your right to live independently and in dignity. I have already said that Israel has no desire to continue to govern over you and control your fate." "Peace should provide security. It should be durable. I’m ready to go far in making painful concessions. But there is one thing I will never make any concessions on and that’s the security of the Israeli citizens and the very existence of the state of Israel. The Palestinians are losing time."